I’m Paula Houseman, and words have always been my favourite playthings. For a humour writer, that’s just how it should be! As a published author of earthy chick lit and romantic comedy, I get to bend, twist, stretch, and juice up universal experiences to shape reality the way I want it, even if it is only in books. But at the same time, I can make it more real so that you, the reader, feel part of the sisterhood. Or brotherhood (realness has nothing to do with gender). Through my books, I also want to help you escape into life and love’s comic relief. And who doesn’t need to sometimes? My style is a tad Monty Pythonesque because I adore satire. It helps defuse all those gaffes and thoughts we’re not too proud of. My hope is that my books—chick lit and romantic comedy—will lighten your inner world, and better our outer one. 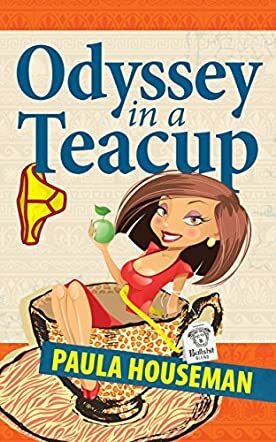 Odyssey in a Teacup: Ruth Roth Series Book One by Paula Houseman takes us on a journey of self discovery through the eyes of a young Jewish Australian girl, Ruth Roth, who along with her three best friends - Vette, Maxi and her cousin Ralph - all try to find their place in a society that doesn’t seem to accept them for who they are. Reminded from an early age by her domineering and sharp-tongued mother Sylvie that she was a “mistake” and a “bad mistake” at that, Ruth wants to allow her natural tendencies to rebel to flourish, but she feels unwanted and her spirit is crushed by the lack of her mother’s acceptance. We follow Ruth and her friends from their innocent youth and childish games through to her approaching middle age, all the time with Ruth searching for the true purpose of her life and her place in this world. Told in part as a series of reminiscences of disasters and bad decisions in all of their lives, Ruth slowly becomes aware that her spirit has been stolen from her and in order to rise above all the dysfunction, she needs to reclaim the free spirit that belongs to her. This story is a mixture of humorous anecdotes that tie together with Ruth and her friends' anxieties, flaws, and self-perceptions. The use of Greek mythology and the duplicitous nature of the gods and their questionable characters and morals is a perfect analogy in describing the foibles and eccentricities that beset this fascinating group of friends. Paula Houseman has given us a plethora of readily identifiable characters from our own lives to hate, to love, and to groan and empathize with in Odyssey in a Teacup. Written with that underlying self-deprecating Jewish humour that we have come to love so much, this story has some truly inspired and genuinely funny moments that had me constantly chuckling to myself, as I was able to identify with it. Writing genuinely funny tragi-comedy is not an easy thing and certainly Houseman is to be commended and admired for her efforts here. For all of us who have suffered periods of self-doubt, this story will help to remind you that we are all unique individuals and it is our diversity, not our homogeneity, that makes us special as a species. This was a cracking good read and I look forward to reading the continuing adventures of Ruth Roth soon.